Any size, anywhere. Domes are the perfect alternative to tents since their ability to sustain heavy loads makes them ideal for rigging audio and lighting equipment directly to the dome frame; thus creating the perfect, all-encompassing stage for performers to showcase their talent. We rent affordable domes for personal use to groups of festival attendees. Geodesic domes are perfect for lounging in hammocks, hosting late-night campsite get-downs, and catching some shade from the blistering sun. Place a hammock sanctuary at your next outdoor event to add an element of comfort and relaxation. We offer these geodesic dome hammock hangouts in a variety of sizes and each one comes fully equipped with hammocks and colorful decorative shade covers of your choice. 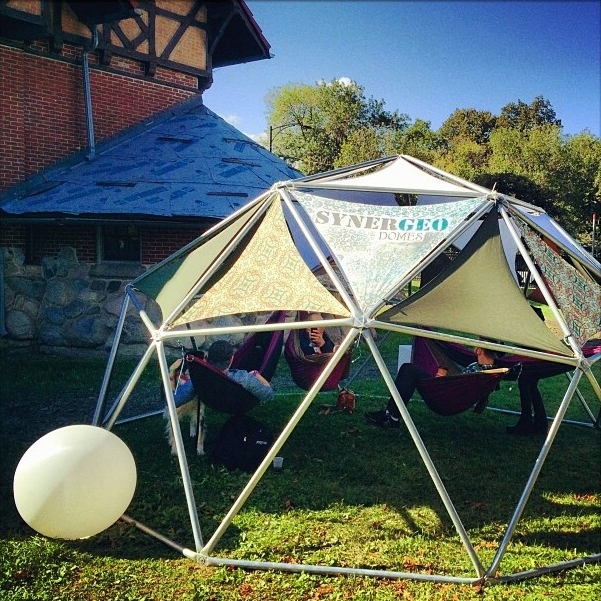 Whether you’re celebrating a wedding, a milestone or anything in between, SynerGeo Domes provide the perfect atmosphere to create memories that will last a lifetime. Our team of geodesic décor specialists will work with you directly to ensure that your party is unforgettable. Increase brand exposure and make a bold advertising statement by promoting your company or brand directly on our eye-catching domes. We offer made-to-order printing of your logo onto the dome cover itself as well as projection mapping custom visual content onto the interior and/or exterior of the dome cover. Our team of consultants will create and deliver an immersive and informative digital presentation that is sure to excite and entice your target consumers.